Cocaine is an alkaloid derived from the leaves of the coca plant. It has medical uses as a topical anesthetic, appetite suppressant and stimulant, but cocaine also has a significant potential for addiction due to its effect on the brain’s mesolimbic pathway. Crack cocaine is a form of cocaine that has a lower level of purity, although it takes effect more quickly because it is usually smoked, thereby producing the intense and desired effects. This increases its addiction potential, given its reinforcing effects such as “I gotta do this again and again.” Treatment for a crack cocaine overdose typically involves neuroleptic medications or benzodiazepines (e.g. Valium) in order to control delirium, seizures or psychosis induced by cocaine use. In addition to emergency procedures, antidepressants may be prescribed. Cocaine is frequently used in combination with other drugs, including alcohol and heroin, and overdose treatment will include any other drugs in the individual’s system (Verdejo-Garcia, 2014). 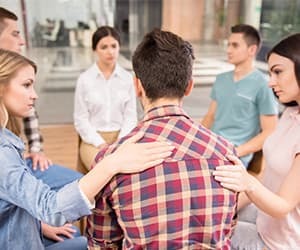 Recovery treatment may include behavioral therapy, such as Contingency Management, which provides rewards for successful efforts in maintaining abstinence, and has been extensively used in cocaine addiction treatment with moderate success (Kosten et al., 2008). Find out more about cocaine addiction recovery by calling 1-888-319-2606 Who Answers? today. Cocaine can also increase athletic performance, especially in sports that require endurance. This drug can also produce restlessness, paranoia and anxiety when its primary effects begin to wear off. Excessive use of cocaine can cause delusions, hallucinations, paranoid psychosis, agitation, nausea, and itchiness or “cocaine bugs” (Gorelick, 2009). The most significant effects of a cocaine overdose include delirium, rapid heart beat (tachycardia), seizures, cardiac arrhythmias, chest pain, hypertension and hyperthermia (Gorelick, 2009; Wilkins et al.,2009). Chronic use or overdose of cocaine causes the user’s brain cells to adapt to high levels of neurotransmitters such as dopamine. This means that chronic users generally must increase their dosage amounts to achieve the desired effect. Very heavy cocaine use may also cause the user to become depressed and experience suicidal thoughts. They may use drugs such as heroin (speedballing), alcohol and marijuana when coming down from a cocaine high. A study on the risk of cocaine addiction was conducted from 2000 to 2001, and the results were published in a 2005 issue of Nature. The subjects included 1,081 subjects who were at least 12 years of age and had used cocaine within the past two years. This study found that the risk of cocaine dependency in these subjects is 5 to 6 percent within two years of the first use. This risk increases to at least 15 percent after 10 years from the first use of cocaine. These are aggregate figures that include both genders and all methods of administration. The dependency rate increases by a factor of 3.4 for users who inject cocaine. Women in this study were 3.3 times more likely than men to become addicted. Subjects who began using cocaine between the ages of 12 and 13 years were four times more likely to become dependent than users who were between 18 and 20 years of age when they first used cocaine. Call 1-888-319-2606 Who Answers? today to discuss your options for crack cocaine addiction rehab and treatment. Some cocaine users may also experience the sensation of insects crawling on their skin (formication) in addition to psychological symptoms that resemble schizophrenia. The symptoms of crack cocaine withdrawal can last for weeks or even months in severe cases. An intense craving for cocaine typically persists long after the other withdrawal symptoms have dissipated and may increase when a crack cocaine addict experiences stress. Addicts who stop using cocaine sometimes turn to other drugs or alcohol to obtain a sense of euphoria. Treatment programs for cocaine addiction often combine cognitive behavioral therapy and motivational therapy. Cognitive behavioral therapy helps patients to recognize and avoid situations that are likely to result in a relapse, while motivational therapy attempts to increase a patient’s incentive to abstain from cocaine. Support groups such as Cocaine Anonymous are based on Alcoholics Anonymous, the original 12-step program. Cocaine addiction generally has a high relapse rate, regardless of the specific method of treatment. Medical treatments for cocaine addiction are currently in clinical trials. The National Institute on Drug Abuse is studying modafinil for this purpose, a drug traditionally used to treat narcolepsy. The use of ibogaine is illegal in the United States but is being studied in other countries, such as Canada, Mexico and the Netherlands. Additional medications under investigation for treating cocaine addiction include Bupropion, Baclofen, Acetylcysteine, Vanoxerine and Vigabatrin. Call 1-888-319-2606 Who Answers? to get help with your recovery after a crack cocaine overdose. We’re available 24/7 to help you!
. Gorelick, D.A. (2009). The Pharmacology of Cocaine, Amphetamines, and Other Stimulants. In Ries, R.K., et al., Editors. Principles of Addiction Medicine. Fourth Edition. Philadelphia, PA: Walters Kluwer/Lippincott, Williams & Wilkins. pp. 133-158.
. Kosten, T.R., et al. (2008). Clinical Management: Cocaine. In Galanter, M., and Kleber, H.D., Editors, The American Psychiatric Publishing Textbook of Substance Abuse Treatment. Fourth Edition. Arlington, VA: American Psychiatric Publishing, Inc. pp. 157-168.
. O’Brien, Megan S., and James C. Anthony. “Risk of becoming cocaine dependent: epidemiological estimates for the United States, 2000-2001.” Neuropsychopharmacology 30.5 (2005): 1006-1018.
. Verdejo-Garcia, A., (2014). Chapter 8: Cocaine. In Allen, D.N., and Woods, S.P., Editors. Neuropsychological Aspects of Substance Use Disorders: Evidence-Based Perspectives. New York, NY: Oxford University Press. pp.157-182.